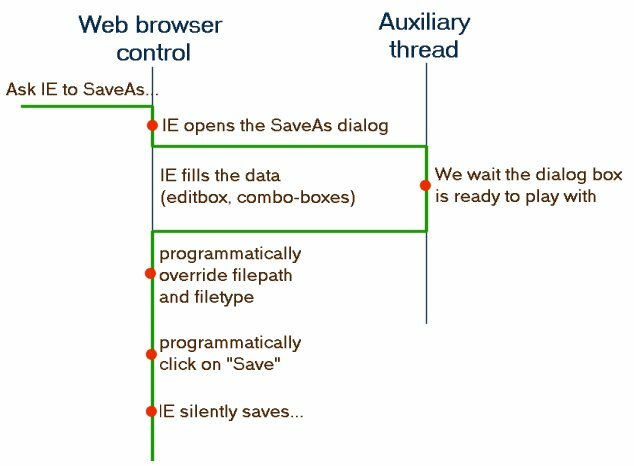 The purpose of this article is to show how to automate the full-fledge Save As html feature from IE, which is normally hidden to those using the Internet Explorer API. The restriction is that we are talking about the Html code only, not the web page. Of course, what is interesting is to gain access to full Html archives with images and so on. Because there is no "public" or known way to ask for this feature without showing one or more dialog boxes from IE, what we are going to do is hook the operating system to listen all window creations, including the dialog boxes, then ask IE for the feature, then override the file path from the dialog boxes without being seen. Finally we mimic the user clicking on the Save button to validate the dialog box, and we unhook ourselves. That's done ! This was the short workflow, but there are a few tricks to get along, and this article is a unique opportunity to go into details. By the way, the code is rooted by an article from MS about how to customize IE Printing by hooking the Print dialog boxes, see here or here. In the code above, it is funny to remark that to select the kind of Html we want (full Html, archive, code only, or txt format), we not only select the adequate entry in the combo-box, we also send IE a combo-box CloseUp notification, because that's what IE has subscribed for to know we want this kind of Html. This behavior is known by hints-and-trials. This article describes a technique to gain access to the full-fledge Save As Html feature exposed by IE. I have never seen an article about this topic on the net, whereas it's easy to figure out it is a compelling feature for developers building web applications. The application is just a simple MFC-based CHtmlView application embedding the web browser control.